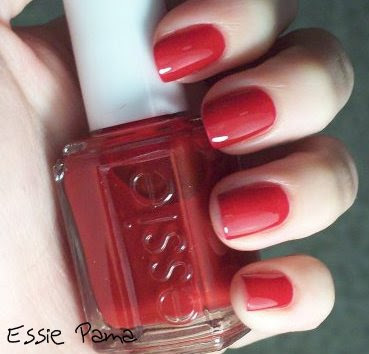 Essie and Pama teamed up to create a polish capturing the lush red of a pomegranate. Pama hosted a give away of the polish, and it went fast. I was surprised that I was able to get one. It's pretty much your run of the mill pink based red creme polish. It applied wonderfully and might even be jelly-ish. If you missed out on this give away don't be disappointed because it's dupe-able. I've been really impressed with Essie as of late, awesome colors, formula, and wear. As for pomegranate flavored liqueur, I've never tasted it. The website is pretty nifty though and they seem to have some good recipes. Head on over there and explore, Pama Liqueur. That looks amazing with your skin tone! Essie Pama is PERFECT for your skin tone. Flawless application as well! I tried to get the Essie Pama but no luck. Instead I was sent a very nice bracelet. It's a stretch bracelet with red beads and a Pama charm. It was totally unexpected. I love the bracelet! This color looks terrific. I also tried to get this color to no avail. I must track it down! This so good on you! I really like Pama! Perfectly Polished Tips by Dami is licensed under a Creative Commons Attribution-No Derivative Works 3.0 United States License. Permissions beyond the scope of this license may be available at perfectlypolishedtips@gmail.com.